The Boeing 747 began its journey Feb. 5 and will arrive Feb. 10. Why did the Boeing 747 cross the road? To start a new life as a hotel attraction in the Netherlands of course. The decommissioned 747-400 created a bizarre sight as it rumbled across a major highway that had been closed to traffic to allow the huge airplane to make its eight-mile (12.5 kilometers) final journey by road from Amsterdam's Schiphol Airpor. It's set to become a visitor attraction, known as the Corendon Boeing 747 Experience in the garden of the Corendon Village Hotel in Badhoevedorp. While the hotel chain is keeping specifics under wraps, spokeswoman Daisy Homoet-Mijnals told CNN that it will be a "huge attraction for everybody who wants to experience the sensation of flying." The installation will incorporate aviation history and art, as well as "3D, 4D and 5D" elements. Visitors will have access to the plane's cockpit, and will be also be able to walk over its wings. Corendon Hotels & Resorts obtained the Boeing after its last commercial flight in November 2018, when it traveled from Los Angeles to Amsterdam. It was subsequently flown to Rome, to be stripped of its KLM colors and repainted in Corendon's corporate red and white livery. On its return to the Netherlands, all reusable components were removed by aircraft recycling company AELS. Almost 9,000 people applied to win tickets to watch the plane's journey to Badhoevedorp in person, according to Corendon. Only 6,000 were successful, but the hotel chain set up a livestream for undeterred enthusiasts to watch from home. You can still watch the video here, if you missed the live updates. "For a lot of people this is a historical moment, because they have a special connection with the 747, the biggest invention of Boeing," Homoet-Mijnals said. 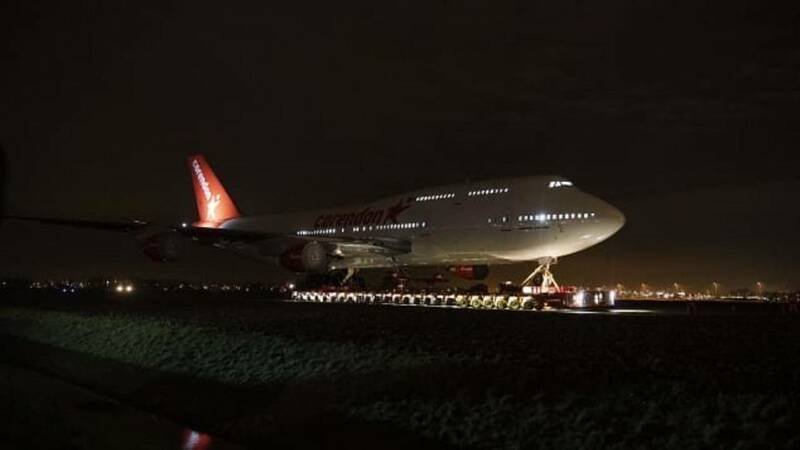 The first stage of the journey began at night on February 5, when the jet, propped on a self- propelling trailer from transport company Mammoet, left Schiphol Airport. The plane was first moved towards a provincial road, crossing over fields and bridges on the way. The Boeing then stood in a farmer's field alongside the A9 highway -- no doubt baffling passing drivers -- as Mammoet assembled purpose-built roads on which the plane traveled. On the evening of February 8, the aircraft crossed the highway, in what the hotel company called "the most spectacular part of the transport." The final stage of the journey began on the evening of February 9, when the Boeing crossed one more road before arriving at its new home the next day. "Transporting a Boeing 747 (in this way), including the wings, has never happened before," Homoet-Mijnals said. "It's an exciting but also very difficult project at the same time."